Nutri Ninja Blender with recipe book, 900 watts, UL/CSA Approved. 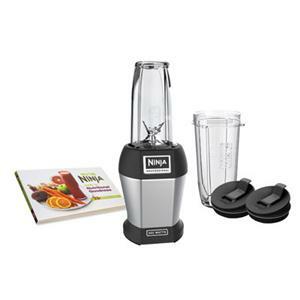 Pro Extractor Blades from Ninja and the most powerful motor in class combine to deliver extraordinarily smooth nutrient packed smoothies and drinks. Nutri Ninja excels on the hardest, most challenging ingredients: tough leafy greens, whole stems, seeds, frozen berries, and ice! Other blenders and drink makers say they can, but only a Nutri Ninja delivers that silky smooth consistency. The Pro Extractor Blade - High quality stainless steel blades - Each part designed to deliver smooth results, from frozen or fresh ingredients. Asymmetric design to maximize food contact and crush ice. Vertical blades: promotes movement of ice/hard items. Long lower blades to create high speed cyclonic action. Nutri Ninja Single Serve Cups-18, and 24 ounce sizes -High quality TritanTM material -BPA free, dishwasher safe, and extremely durable -Fits in most car cup holders. Sip & Seal Lids -Transport your drinks securely -Lid stays open while you pour.